UPDATED: Thu., March 28, 2019, 10:50 p.m. 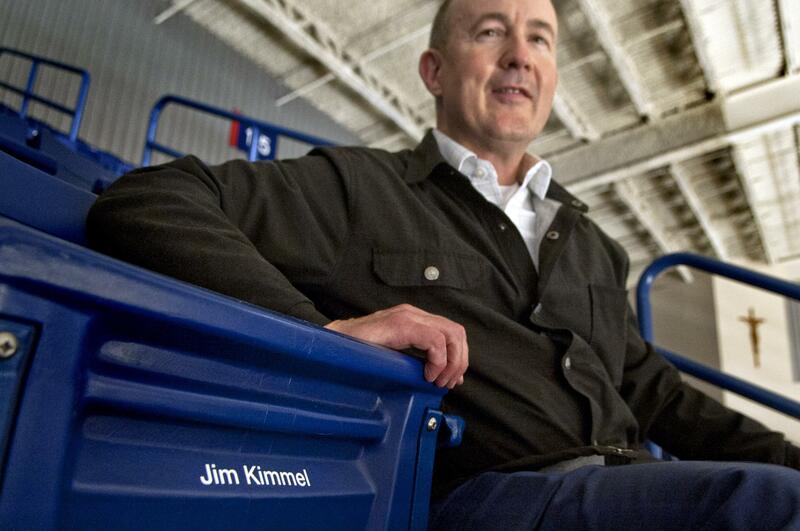 Late-night talk show host Jimmy Kimmel may be a skeptic when it comes to Gonzaga University’s existence, but two seats bear the Kimmel name inside the university’s McCarthey Athletic Center. Spokane resident Jim Kimmel, former owner of Kimmel Athletic Supply, and his son, Jimmy Kimmel Jr., are season ticket holders for Gonzaga basketball. Their names are printed on reserved seats in the arena. “(Gonzaga) doesn’t exist and here he has a seat in the arena,” Jim Kimmel said, chuckling at the coincidence of sharing a name with the TV show host. The talk-show Kimmel has made a running joke out of questioning Gonzaga’s existence, beginning with a March 19 monologue on “Jimmy Kimmel Live!” two days before the Bulldogs’ first NCAA Tournament game against Fairleigh Dickinson. “Apparently, I opened a Spo-can of worms because people in Spokane are angry because I outed them, I guess, with this ruse they’ve been selling,” Kimmel said. Kimmel’s monologues continued this week with a skit featuring a replica of Gonzaga’s mascot, Spike, that aired Tuesday night. Gonzaga employees, a radio announcer and a supporter appeared alongside fictional characters such as the Easter Bunny, Spider-Man and the tooth fairy on Wednesday. The next day, Guillermo Rodriguez, sidekick and cast member on “Jimmy Kimmel Live!” visited Gonzaga basketball players at the Honda Center in Anaheim, California. Rodriguez, wearing a Sherlock Holmes costume with a tobacco pipe and magnifying glass, asked players about Kimmel’s claims. Gonzaga University students started an online petition requesting that Kimmel speak at the university’s commencement ceremony. The petition has gained traction, receiving more than 2,195 signatures since it launched last week. “I think it’s hilarious that he’s come up with the idea that Gonzaga doesn’t exist,” the elder Spokane Kimmel said. Jim Kimmel has another connection to Gonzaga through Kimmel Athletic Supply, which outfitted athletes at Gonzaga and other schools in the region for more than 49 years. The company, which was described as “the leading distributor of customized team apparel and equipment in the Pacific Northwest,” was acquired by Dallas-based BSN Sports in 2017. Kimmel joined the BSN Sports management team following the acquisition. Kimmel invites his doubting TV counterpart to come to Spokane to witness firsthand that Gonzaga University does, in fact, exist. “I’d love to have him come here, and he can sit in his own seat there at GU,” he said. Published: March 28, 2019, 5:02 p.m. Updated: March 28, 2019, 10:50 p.m.